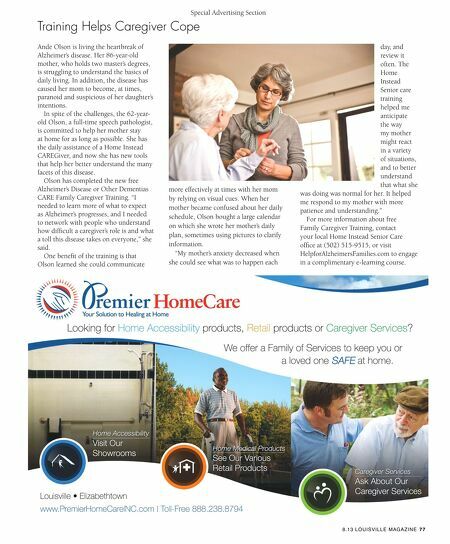 Special Advertising Section Always Best Care Senior Services — Peace of Mind and Maximum Independence www.seniorcarelouisville.net 76 LOUISVILLE MAGAZINE 8.13 Always Best Care's non-medical in-home care helps seniors and people with illnesses or disabilities live safely at home as long as possible. Owners Robin & Ken Helfers' business goal is not to be the biggest home care agency, but to be the best, by maintaining a personal touch. 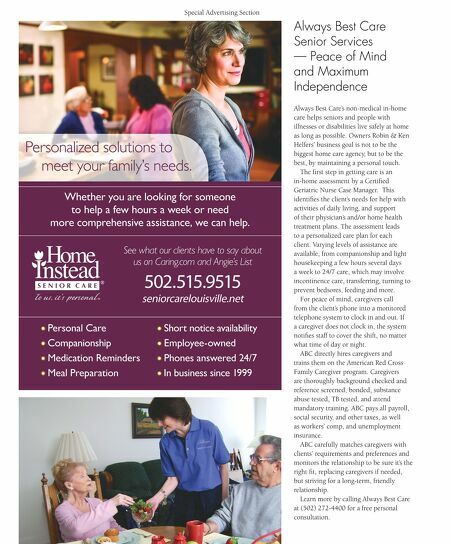 The frst step in getting care is an in-home assessment by a Certifed Geriatric Nurse Case Manager. This identifes the client's needs for help with activities of daily living, and support of their physician's and/or home health treatment plans. The assessment leads to a personalized care plan for each client. Varying levels of assistance are available, from companionship and light housekeeping a few hours several days a week to 24/7 care, which may involve incontinence care, transferring, turning to prevent bedsores, feeding and more. For peace of mind, caregivers call from the client's phone into a monitored telephone system to clock in and out. If a caregiver does not clock in, the system notifes staff to cover the shift, no matter what time of day or night. ABC directly hires caregivers and trains them on the American Red Cross Family Caregiver program. Caregivers are thoroughly background checked and reference screened, bonded, substance abuse tested, TB tested, and attend mandatory training. ABC pays all payroll, social security, and other taxes, as well as workers' comp, and unemployment insurance. ABC carefully matches caregivers with clients' requirements and preferences and monitors the relationship to be sure it's the right ft, replacing caregivers if needed, but striving for a long-term, friendly relationship. Learn more by calling Always Best Care at (502) 272-4400 for a free personal consultation.